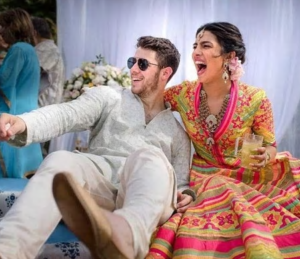 Actress Priyanka Chopra married singer, songwriter Nick Jonas in a three day extravaganza in India over this weekend. She’s one of India’s highest-paid and most popular celebrities, best known in the US for playing the lead in Quantico, also acts as a producer and is a UNICEF ambassadress for children’s rights. His father conducted a Christian ceremony on Saturday in Jodhpur, India with an enthusiastic and colourful Sun Jupiter in Sagittarius in place square a glitzy, showbiz Mars Neptune in Pisces. Venus in sociable Libra was opposition Uranus and square the North Node – so it’ll be a quirky, unconventional and adventurous match. 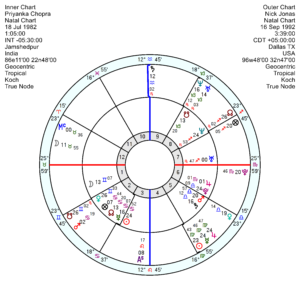 She was born 18 July 1982 at 1.05am Jamshedpur, India, (astrotheme) with two army physician parents and has a quick-witted 3rd house Cancer Sun square a formidably determined Pluto Mars Saturn in Libra. Her Moon and Venus in Gemini give her a lighter-hearted side; and with an independent-minded Uranus in her 7th, she’s her own person. 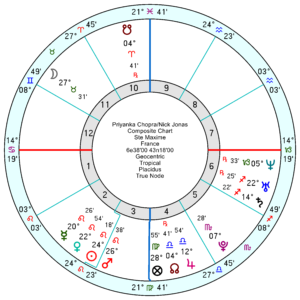 A film-star Neptune in the 8th gives her an aura as it opposes her Venus and is inconjunct her Sun. 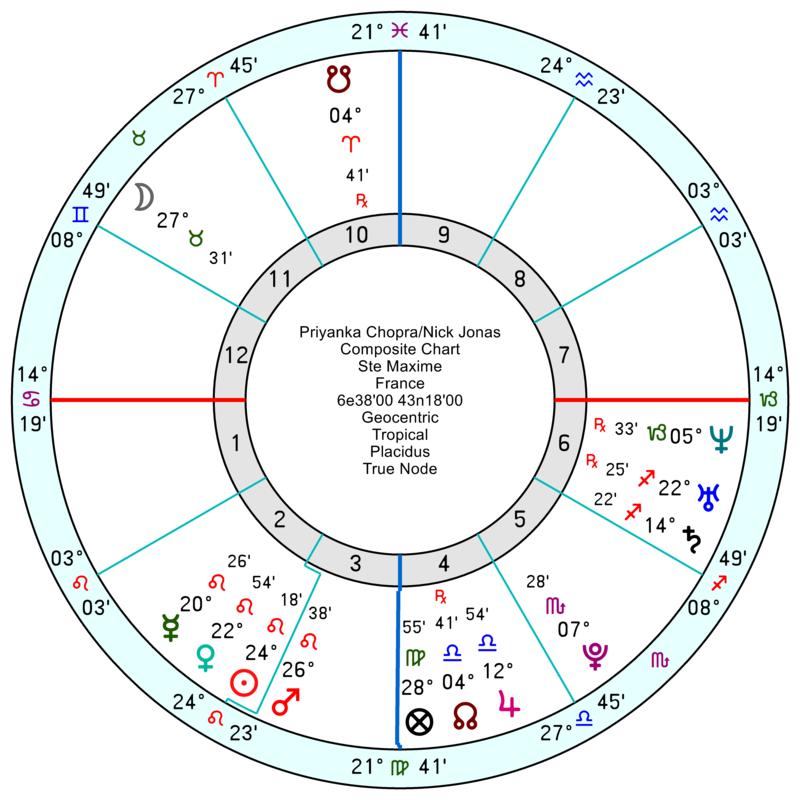 Nick Jonas, 16 September 1992 3.39am Dallas, Texas, formerly of the teen band the Jonas Brothers, is an enthusiastic and hard-working Sun, Mercury, Jupiter in Virgo in the financial 2nd; with a 10th house Taurus Moon, good for a public career, widely opposition Pluto in the 4th square a 7th house Saturn in Aquarius. He has a 6th house Uranus Neptune in Capricorn and suffers from diabetes. Both of their 7th house and Moon aspects are tough – her Moon is in an overly-disciplined and angry trine to Saturn Mars, and his Moon is tied into bleak Saturn Pluto. To some extent they’ll understand each other’s backgrounds and emotional glitches but it won’t be all sunshine and roses. She has a needs-independence Uranus in her 7th house of close relationships; while he has Saturn in his 7th, maybe why he’s opted for an older partner but partnerships will mean hard work for him. 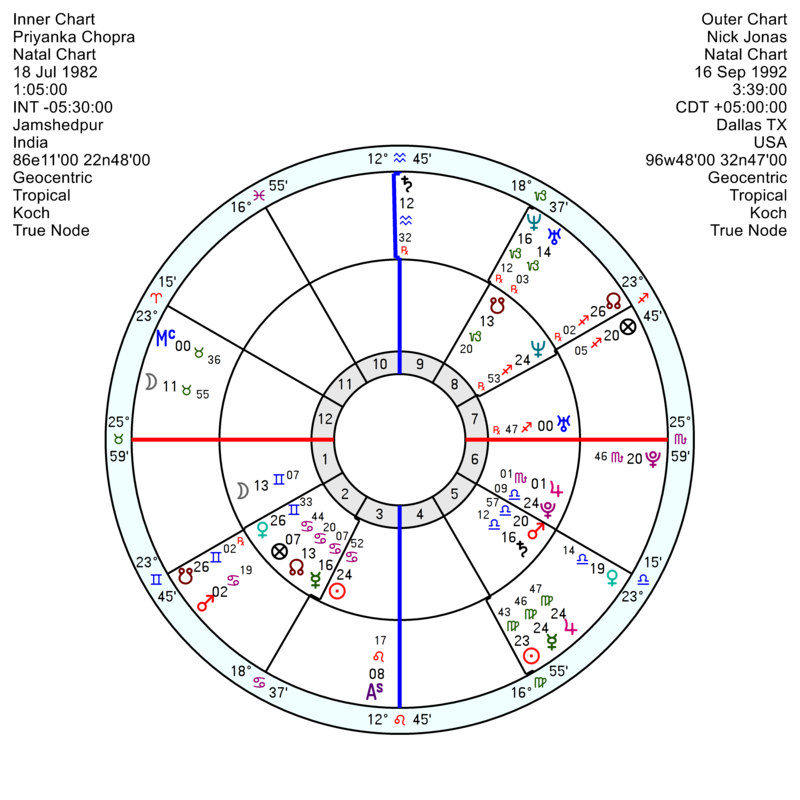 His Venus in Libra is conjunct her Saturn, Mars, Pluto which looks fairly downtrodden. Their relationship chart, however has a wonderfully exuberant and affectionate composite Sun, Venus, Mercury, Mars conjunction trine Uranus; with a happy-home Jupiter in the 4th. Admittedly the composite Moon is hidden and squaring Mars which will make for some heated moments, but overall it could be fun.